When we woke up the next morning, I took the dogs for a short walk but there weren’t many hiking trails within easy reach of our site so I packed up the site and we drove to La Source Trail. 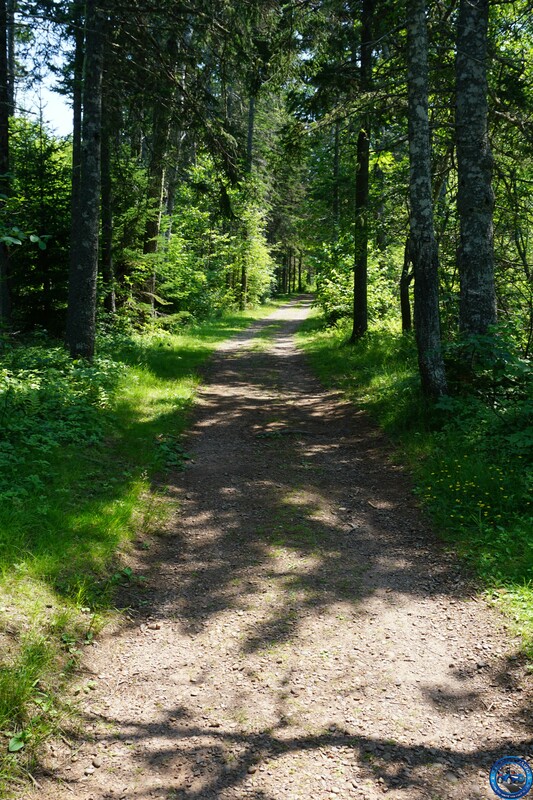 The parking lot is a junction for several of the trails and is on the Kouchibouguac River so it seemed like a good place for a walk. 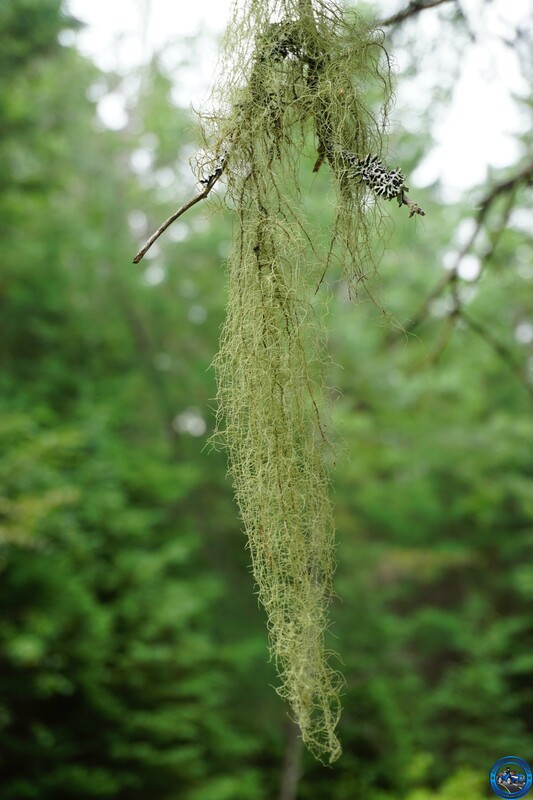 The trails are nice and wide and flat making them good for hiking and cycling and there was old man’s beard lichen hanging off all the trees which reminded me of the spanish moss we saw on our recent trip to the south. I saw one trail that was more up our alley: a narrow band that wound through trees but as I got closer, I saw the sign that said it was closed. Darn. 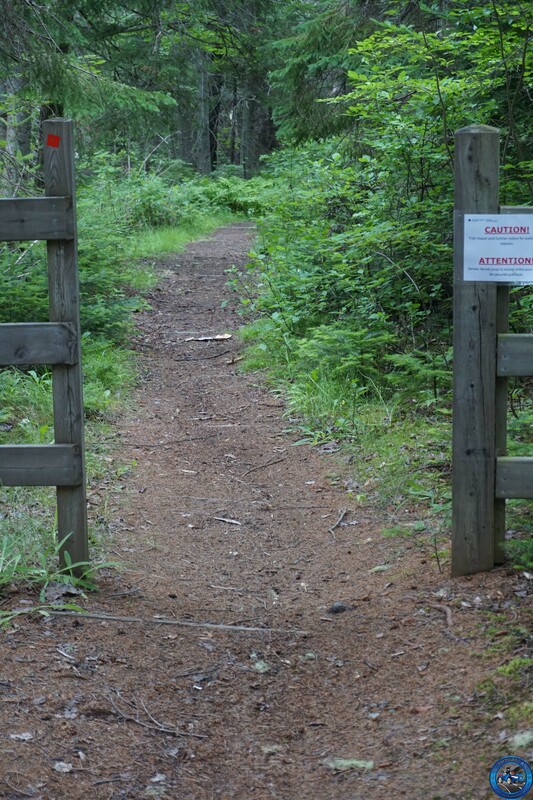 Not only was it a good place for easy trails but it was also a good place for mosquitos and deer flies so it was another short walk before jumping back into the car. A nice place to watch over the river. I was driving along Route 16 continuing south and east, when we passed something that took my mind a few minutes to process. 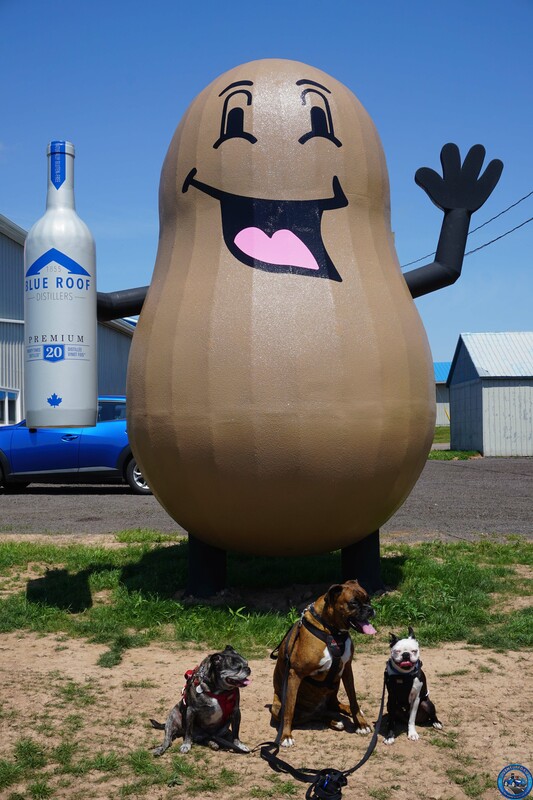 Why on earth is there a giant peanut on the side of the road…OH MY GAWD I SAW A DISTILLERY! That wasn’t a peanut; it was a potato. I was debating whether I should turn around when I saw the sign for Route 16 Diner. Well I was hungry and it would give me a chance to inquire about the giant peanut…err potato. I was too late for breakfast but fish and chips would be the next best thing. 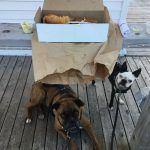 There was no outdoor seating so after placing my order, I brought the dogs out of the car and stood at the deck along the side of the building and used the railing as a table. Of course the dogs got some attention. And maybe a few pieces of errant fish morsels just happened to fall. 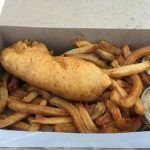 The fish was wonderful and the batter light and crispy and not at all greasy. The fries had some nice flavour to them. Heck even the coleslaw was tasty. I went inside to pay after a lovely, and filling, meal and that was when I noticed the bottle of Blue Roof vodka on the shelf. There was a hand-written sign that proclaimed it was local so I casually asked if it was worth going. Before I even finished my question, the waitress blurted out “Yes you have to go and tell them Brenda sent you.” OK then. I loaded the dogs into the car and we made the short trek back to Blue Roof Distillery. Now had I not had a carload of dogs, I would have taken them up on the offer of a distillery tour. Since I couldn’t take the tour, I could at least leave with some vodka. And a photo of the dogs with the potato. Still looks like a peanut to me. We continued and soon drove over the Confederation Bridge onto Prince Edward Island. I had never been to the island before but I had heard how beautiful it was. Prince Edward Island National Park is on the north side of the island and it wasn’t long before we arrived. It was a nice drive across the province but I think that because it had been hyped so much it was actually a little bit of a let down. To me, it looked exactly like the area where I live in southern Ontario; just some areas had red soil. Then we got to the coast and that was where it really stood out. I went immediately to the office at Stanhope in the park and was informed that all of the sites were booked. Oh darn. There were some places around the area but they didn’t know if any of them were available. Well since we were there, we could at least go for a walk. Of course, they were going to be short walks because even though we were literally right next to the ocean, it was HOT. Oh and dogs aren’t allowed on the beach so no swimming. Double darn. It’s a small park, only 27 sq km, and divided into three segments so finding a trail was easy. We happened to be in the Brackley-Dalvay section and when I saw a sign for Bubbling Springs and Farmland Trails, that seemed like a good place to stop. We walked past an old cemetery and looked at the remains of used to be farms until we got to the bubbling spring. Now when someone says “bubbling spring”, I expect a lively ribbon of water that joyously bounces along rocks. 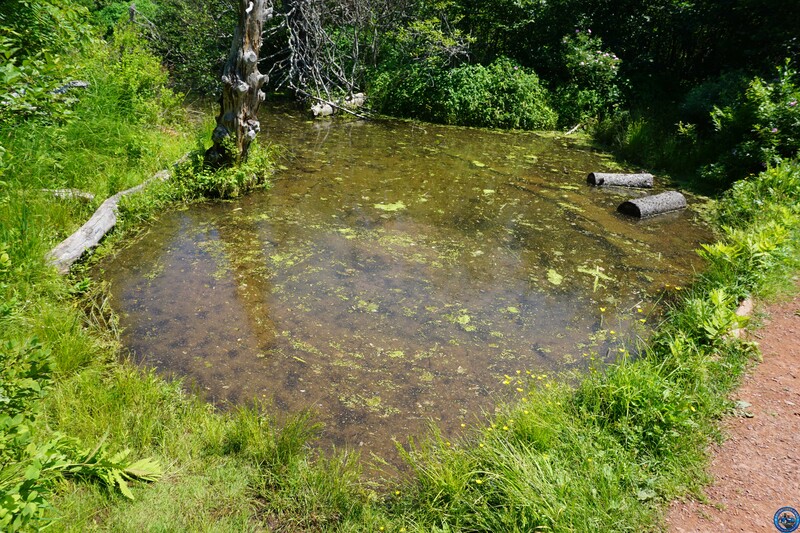 What I saw was an almost stagnant pond. But hey if you looked REALLY closely at the bottom of the pond, you would see some some bubbles forming out of the muck. Well done to whoever named the trail (slow clap). It says something when the dogs aren’t too mad at me for not letting them swim, especially when it is so hot. We slowly walked back to the parking lot and everyone had their fill of water before jumping into the car. Because of the heat and more mosquitos, I decided that we would move on to find a place to stay for the night. 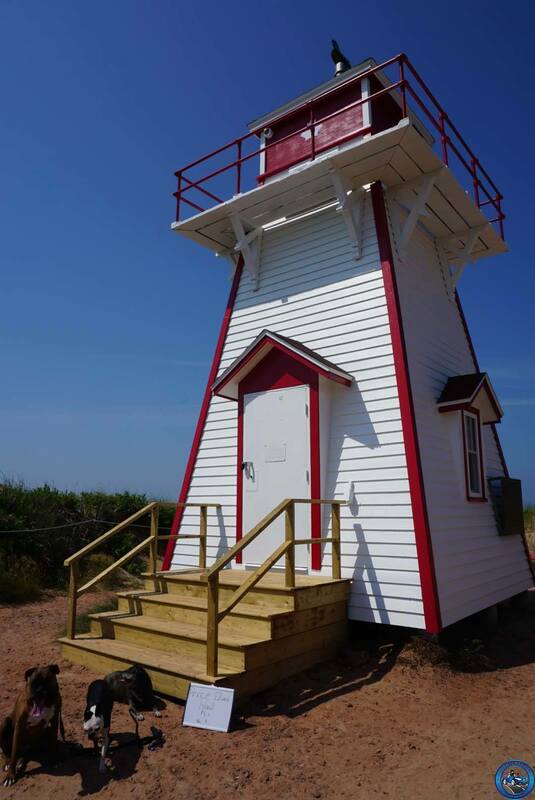 But not before we stopped at the Covehead Lighthouse for a few photos. The sand was so light that when I set up the sign, I turned back to see Leo rolling with Piper rolling next to him. Jack seemed completely unimpressed. Once she finished rolling, Piper channelled her inner terrier and took a moment to dig. A small confession: I did not go to any of the Green Gables attractions at the park. I have actually never read Anne of Green Gables and have no desire to read it now. Having said that, I heard a lot of people saying that it was worth a trip. Maybe another time. Have you ever had a set of seemingly random events that lead you into something that you would never have experienced? Well get ready to have your socks knocked off because as we were preparing to leave the park, my phone began to ring. My phone rarely rings. It was my mechanic calling to ask me a question. I offhandedly mentioned that I was in P.E.I. and he told me that I had to go to Red Point because it’s really cool. Oh and go to Lightening Shine. After I hung up the phone, a quick search revealed that “Lightening Shine” is actually moonshine produced by The Myriad Distillery. With night plans still up in the air but having to go back toward the south side of the island anyway, The Myriad Distillery was in the direction we were going. We did find the distillery a short drive away, perched on top of a hill that overlooks the ocean and I paused for a moment to enjoy the view. I stepped into the distillery and was surprised to see row after row of different liquors inside. They don’t just distill moonshine: they also make vodka, gin, pastis, rum, whisky, and brandy. And free samples. Awesome. I sampled both of the moonshines, the vodka, and the gin. The moonshine was quite strong, the vodka was good, but the gin was really good so I bought a bottle and as I was paying, I asked if there was a beach that I could visit with the dogs. I was given directions to a nearby beach and in mere moments, parked at the end of a road near the water. I noticed there were no signs saying that dogs had to be kept on leash. Score! 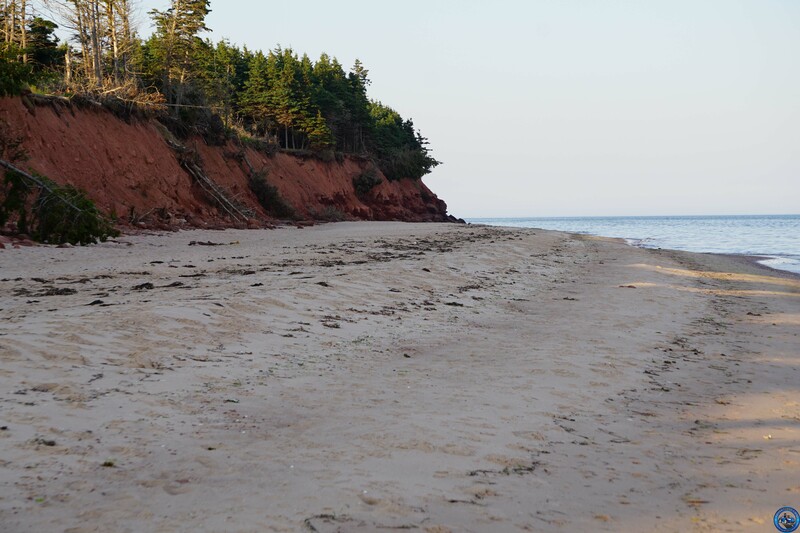 As we walked across red sand and picked our way closer to the ocean it became clear why so many people talk about how gorgeous P.E.I. is: the ocean was calm and the sand and rocks were a muted shade of red that offset the water beautifully. There were several groups of people enjoying the sun so I started looking around to see where we could go and not bother anyone. To my right, the beach curved around and became very rocky and then my eyes focused on a ledge of rock way down the shore. I thought to myself “that’s where I want to go” and so that was the way we started walking. 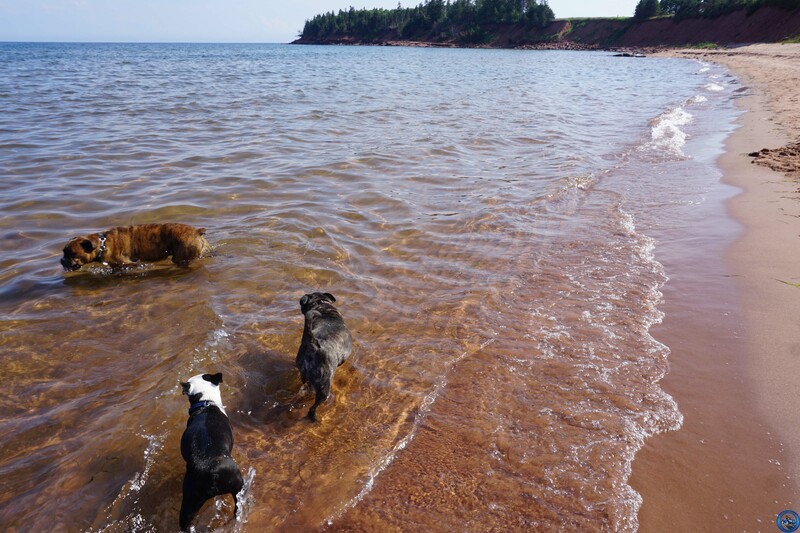 Once we moved far enough away from everyone else, I released the dogs and they all ran right into the water. We climbed onto the ledge and then I saw that it curved around and we continued along until we found ourselves in a mini-cove. I’ll admit that we sat there for a long time. Jack almost gave me a heart attack by climbing paths through the rocks that looked like the sort of place nothing should be walking. When I called him back from the edge, he looked back at me with an indulgent expression that just said “Chill out already”. Finally I dragged myself up and we walked back to the beach. A seemingly innocent dip in the ocean. Always time to stop for a photo. 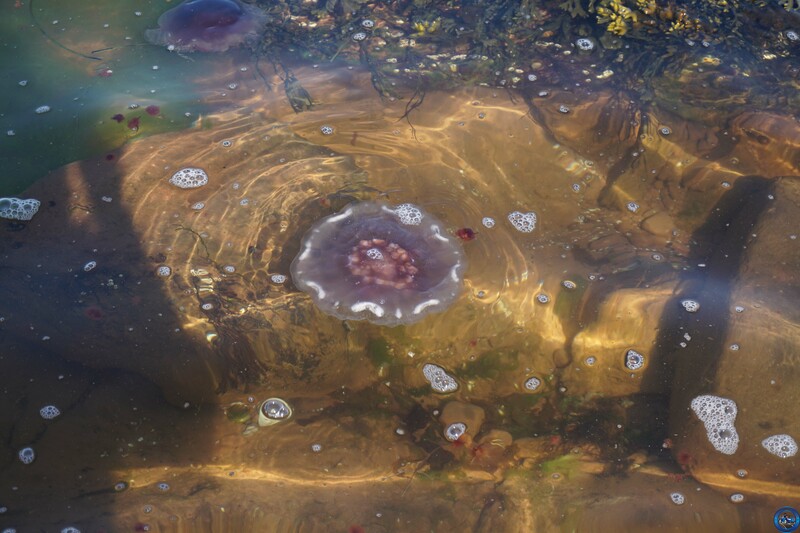 I was watching Jack try to catch the waves when I noticed something floating in the water that I just couldn’t make sense of until I got closer: jellyfish. A whole lot of jellyfish. I had no idea that they came this far north and suddenly I was a lot more nervous about going in the water. I’ve never had the pleasure of being stung by a jellyfish and I didn’t want to change that now. 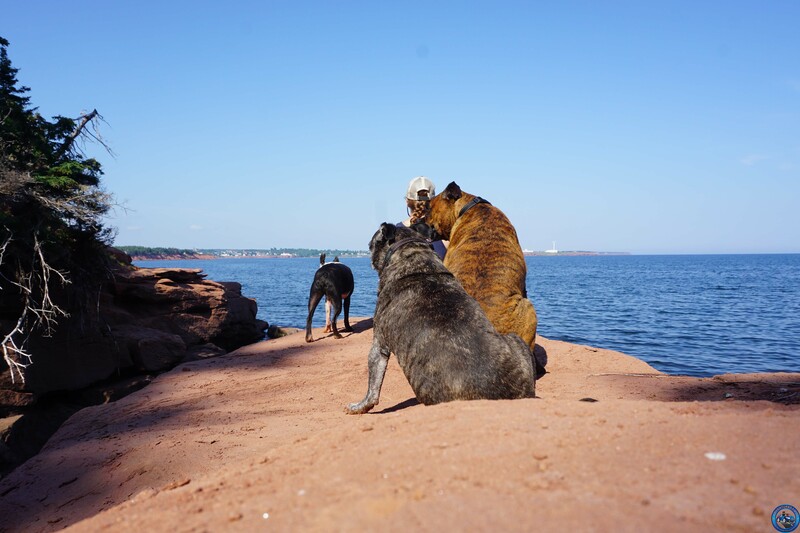 Needless to say, I kept a real close eye on the water around the dogs. We stopped to talk to some people that were enamoured with the dogs and I asked if they knew a good place to eat. They suggested going to the boardwalk in Souris for lobster rolls. Well I AM on the coast and I DO like lobster so once I rubbed the dogs down and loaded them back into the car, we made the short drive to Souris. Sure enough, as described was a boardwalk along the ocean with a collection of huts. The first thing I saw was indeed the Lobster Shack. 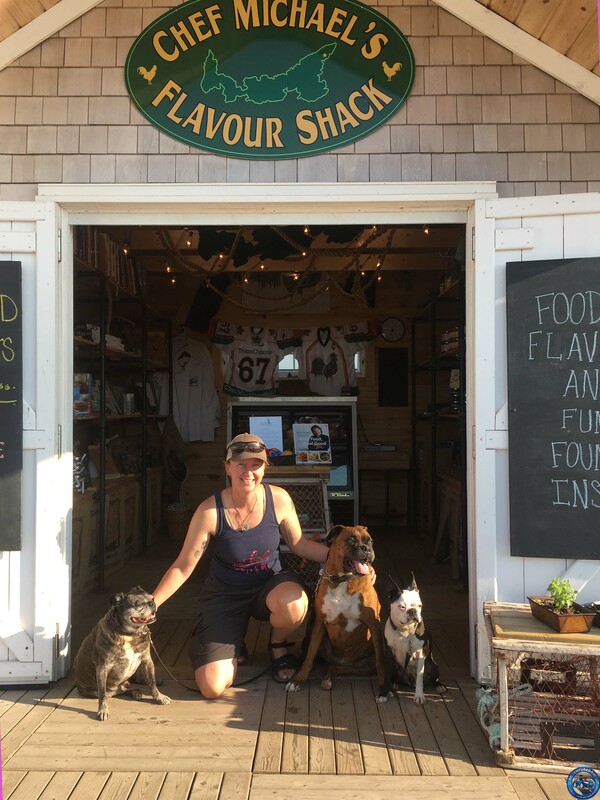 The dogs hopped out and we started to walk towards the beckoning lobster, passing a tourist shack, and then…It took me a second to figure out what I was seeing on the wall of the shack in front of me: “Chef Michael’s Flavour Shack”. Chef Michael? THE Chef Michael?!?! As in Chef Michael Smith??? Along with Alton Brown, he is my all-time favourite chef EVER. I used to religiously watch “Chef at Home” and he completely changed my attitude towards food and cooking. I poked my head into the shack and sure enough, Chef Michael Smith EVERYWHERE! (Insert happy clapping here). The shack was going to be open long enough for me to grab some food so we walked over to the Lobster Shack. I ordered a half dozen oysters and a lobster roll and reached into my pocket. Wait…Ohhhhhhh I left my wallet in the car. Darn. 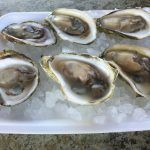 Hustle on back to the car then hustle back with my wallet just in time to get a tray of freshly shucked oysters and a lobster roll with chips and pickles. This is only the second time I’ve ever had oysters. They’re good but not something that I would go out for. I don’t mind the taste so much; it’s the texture and that little bit of grittiness that always seems to find it’s way into the shell. 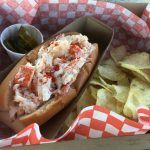 The lobster roll was very good and not too dressed to cover up the flavour of the lobster. The dogs passed out on the ground around me while I gave in to seafood gluttony. I’m surprised that Piper was so mellow because she is crazy insanely in love with lobster. What can I say? She’s my dog and has expensive tastes. We explored a little further down the boardwalk and right behind the Lobster Shack was The Ice Cream Shoppe. I looked through the list of ice cream flavours and finally settled on Island Fantasy: vanilla ice cream and chocolate. Yummy. I took the opportunity to do a quick check for campsites near by and found that we were quite close to Red Point Provincial Park. Sound familiar? The mechanics had suggested going there. Well deal done. To the park. After a quick stop at the Flavour Shack. Dogs were allowed inside so as I browsed the shelves, they sniffed around. Then I felt a little tug on one leash and looked to see Piper sniffing at a pile of lobster traps on the floor. Then before my eyes, she stuck her head into one of the traps. She started to back up and the trap lived up to it’s name; her head was stuck in the trap. I had this image of her freaking out and running around with this mesh trap on her head like some kind of sitcom. Oh crap. I suddenly had to extricate a boxer head from a trap without letting the staff know what was going on. Fortunately the woman working there was chatting with someone outside, so I was able to slip the trap off Piper’s head and tuck it back into place before we casually picked out a few things to buy. I left with some bottles of lemonade and tequila margarita jam. With goodies in hand, we headed to the car and on to the park. I wasn’t quite sure what to expected the park to be but I know that I didn’t expect it to be a wide open field above the shore. Literally it was a big field with site posts. The sites were still quite large but there was no separation between our neighbours. Oh well. At least the ocean was mere steps away. I set up camp and took the dogs to beach. Of course they went right into the water. And when Leo emerged from the water, he dropped into the dry sand and rolled his little heart out. We walked to the end of the beach and started back, pausing to watch birds fly in and out of nests in the side of the high bank. A perfect place for a walk. After the long and busy day, we climbed into the tent while it was still quite light out and soon fell asleep. And then were woken up when the people in the site across from us arrived. They were so loud I could hear the people in the site beside me talking about moving. Wow. Finally they stopped kicking the ball around and arguing about something and things quieted down again. 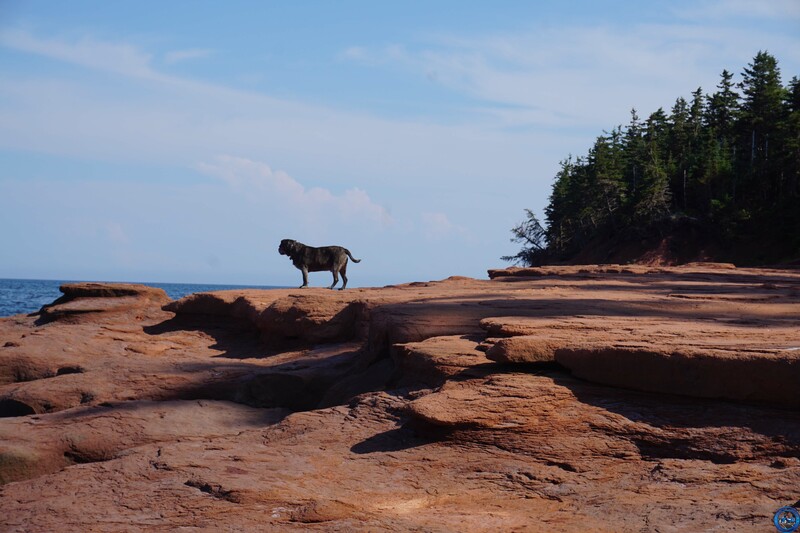 There are two ways to get to the island by car: the first is to drive the Confederation Bridge from Cape Jourimain in New Brunswick and the other is to take the ferry from Caribou, Nova Scotia. Of course, flying is an option as there is an airport in the island’s capital of Charlottetown. The island itself is small and you can see a lot in a very small amount of time. Given that the National Park is in different sections, there are different routes to take to get to each part. Once you’re there, you just follow the coast. Red Point Provincial Park is about 10 minutes east of Souris along Rte 16 then south (right) on Red Point Road. Obviously the Green Gables Heritage Place would be a good place to start; if you’re a fan that is. 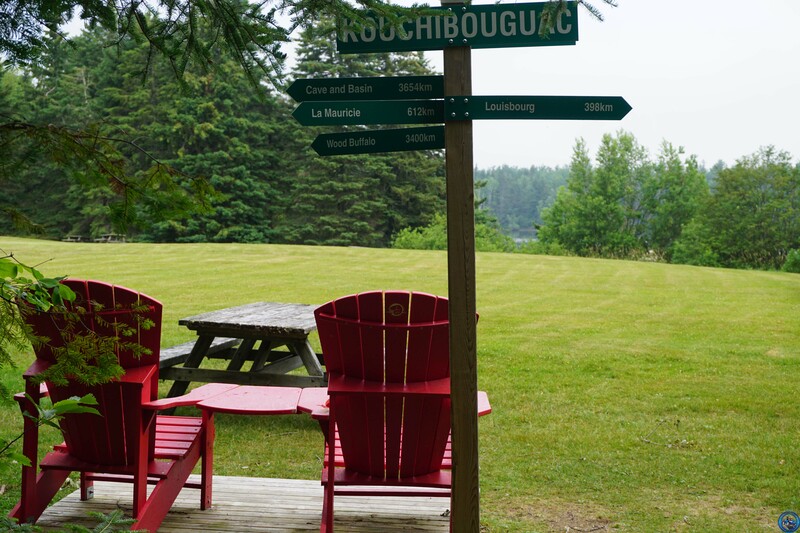 Otherwise, there are plenty of trails for hiking and the beaches are a spectacular place to sit and relax. The land is flat and easy to negotiate and there is a paved trail that runs parallel to the coast. 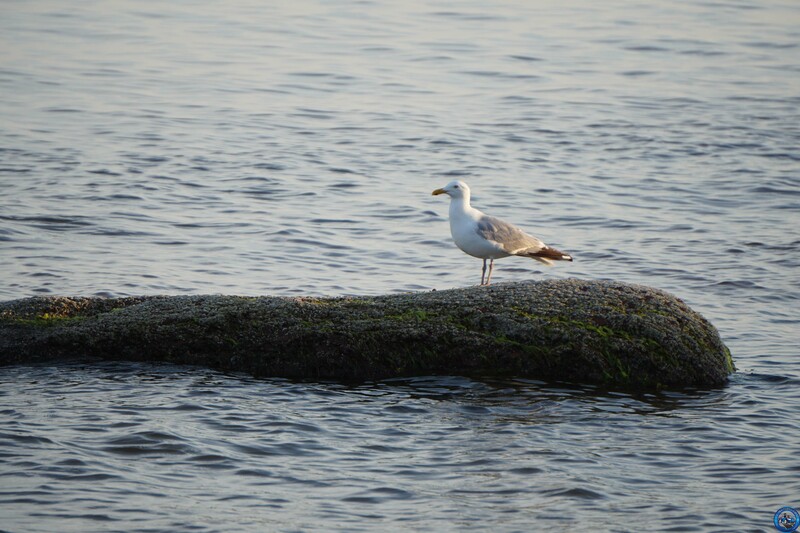 Even though we didn’t explore too much, there were plenty of birds to see and I can imagine this being a birder’s dream. This is a small park geared more towards families. 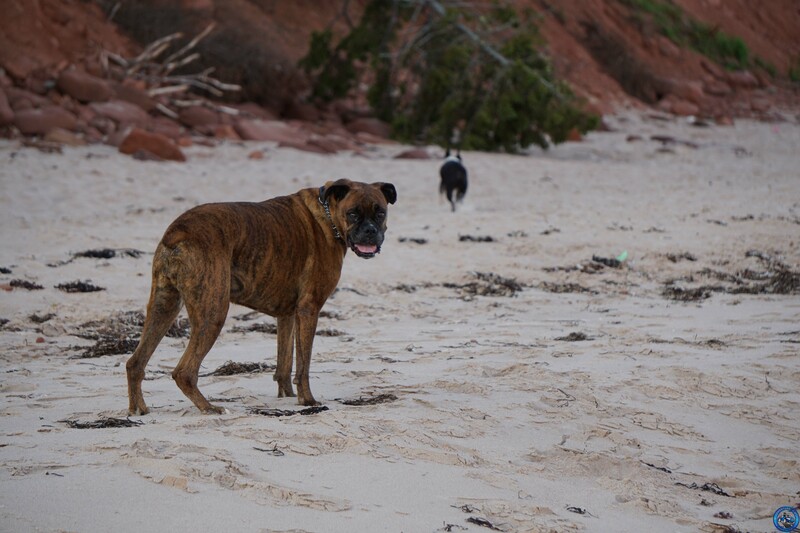 The beach is large and supervised and there is lots of space to play. I passed by plenty of places to eat so finding grub is not an issue. Of course the boardwalk at Souris is an option for seafood and ice cream. 9 response to "A Blue Roof and Red Rocks"
Isn’t Bubbling Spring just a giant letdown? We were likewise unimpressed. I didn’t want to say that. I may have been thinking it but I didn’t want to say it. I mean TECHNICALLY there is bubbling and TECHNICALLY it is a spring. It’s just a slow moving bubble in water that smells like rotten eggs. Wish I’d seen Piper’s head in the lobster trap. I wanted to get a picture sooooooo badly. 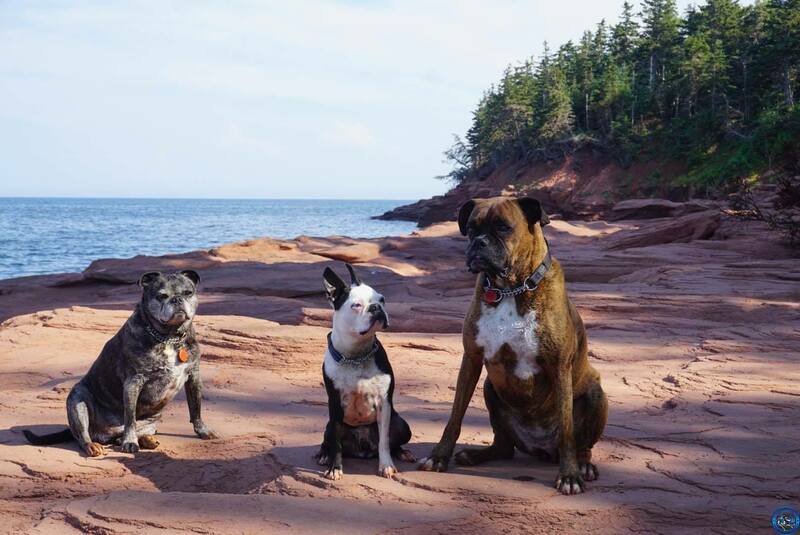 Sounds like you all had a great adventure and the dogs sure enjoy the beach. Red sand is new to me….it looks beautiful. Glad no one was stung by the jellyfish. That could have been a disaster – but they are beautiful creatures, aren’t they? It’s wonderful just how much they enjoy the water and makes me so happy to watch them play on the beach. I never knew there could be so many different shades of red sand. And you’re right: they are beautiful and I have soooooo many photos of them that it’s not even funny. I’m so envious of your travels, not just for visiting fantastic and interesting places but the fact that dogs seem to be allowed far more often in those places than state-side. *Sigh* Wish people here weren’t such cretins about dogs on trails, beaches etc. Thank you. Although I found more businesses were more dog-friendly down south than they are up here. And if I HAVE to be honest, there are a lot of places where dogs have to be on leash and I plum forget 😉 don’t tell. Having said that, we actually found a national park where dogs aren’t allowed anywhere except picnic sites. Can you believe that? Great post. 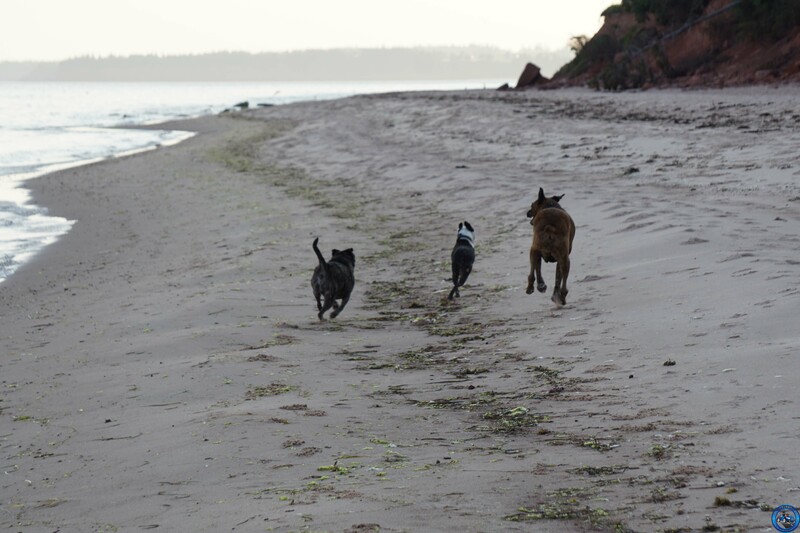 The photo of the dogs running on the beach was beautiful. Made us happy too.